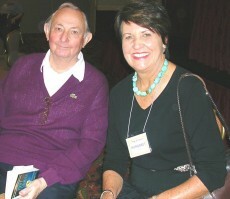 2014 marked the 10th anniversary of the Tony Hillerman Writers Conference! We celebrate author Tony Hillerman’s enduring influence with a program that features a great mix of presenters who have joined us for past conferences and seasoned authors we are eager to work with. We are blessed to have met so many talented writers over the past decade, and thrilled that many of our attendees are now published! Their success is the frosting on our anniversary cake.